Putin recognizes Crimea as sovereign and independent state - video door phones,intercom system,video door phone,modules.CCTV. MOSCOW - Russian President Vladimir Putin signed on Monday a decree recognizing Crimea as a sovereign and independent state, ignoring Western sanctions on several Russian officials. "Considering the will of the peoples of Crimea expressed at the all-Crimea referendum on March 16, 2014, I hereby decree that the Republic of Crimea, where the city of Sevastopol has a special status, be recognized as a sovereign and independent state," Putin said in the decree. The decree entered into force upon signature, the Kremlin press service said, adding Putin is expected to address the Federal Assembly over Crimea and Sevastopol's requests to join Russia on Tuesday. 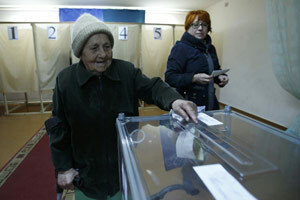 In the Sunday referendum, some 96.6 percent of the voters supported Crimea, a Ukrainian autonomous republic, to join Russia. The Crimean parliament adopted on Monday a resolution on the independence of the territory and asked Russia to admit it as its new constituent member. Putin's decree came hours after Western countries announced sanctions against Russian and Ukrainian politicians. The European Union (EU) decided on Monday to impose sanctions, including visa bans and freezing assets, against 21 Russian and Crimean officials, identifying them as "associated with the decisions that Russia has made about Crimea." British Foreign Secretary William Hague said it is "possible" that EU would impose sanctions on more figures in the future. The United States also put such high-profile officials as Russian Deputy Prime Minister Dmitry Rogozin and Federal Council, upper house of the parliament, chairperson Valentina Matvienko on the sanction list. Matvienko slammed the measure as "political blackmail." The sanctions include assets freeze and travel bans on the 11 people, who the United States said are responsible for threatening Ukraine's sovereignty and territorial integrity. Although Putin was not on the name list, Washington warned that it would not "rule out individuals or rule out actions," threatening additional measures against Russia. Shortly after official results of the referendum came out, UN Secretary-General Ban Ki-moon called on all parties concerned "to work for a resolution guided by the principles of the United Nations Charter." Japan announced Tuesday a set of measures to punish Russia over the Ukraine crisis, including suspending talks on easing visa restrictions for Russian citizens. China on Monday reiterated its position on the ongoing crisis, urging relevant parties to seek a political solution through dialogue as soon as possible. "China is closely following the situation in Crimea and we call on all sides to exercise restraint," Chinese Foreign Ministry spokesman Hong Lei said. 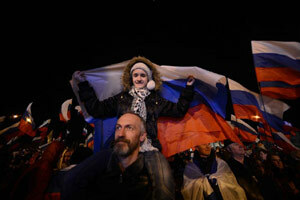 A recent survey jointly carried out across Russia by two Russian pollsters -- the Public Opinion Foundation and the All-Russia Public Opinion Research Center -- found that 91 percent of the respondents favor Crimea's entry in the Russian Federation.